This woman is the most modest overachiever I have ever met. Garnet supports grassroots sport as her day job and manages to win championships all over the place in 7’s and women’s rugby 15’s “on the side” (since women’s rugby isn’t full time professional….). I met Garnet through our mutual friend, Samara, back in 2013, when she still played tag rugby (she went to the world cup for Tag in 2015!). She is one of the loveliest and most accomplished people you will meet, as long as you don’t meet her in the rugby pitch, in which case, prepare to lose. 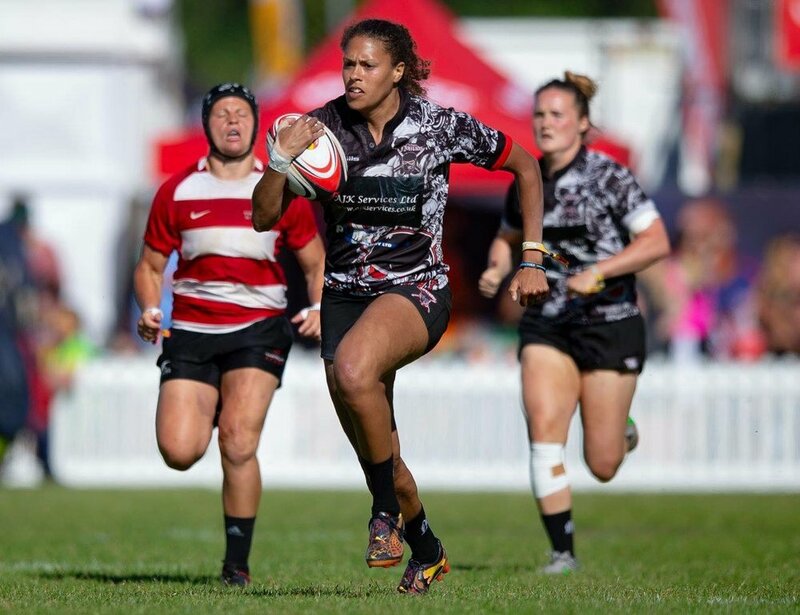 Garnet also represented England in Rugby 7s as part o the country’s most competitive and successful national teams. She deserves every accolade that has come her way and I am sure there will be many more. Garnet, what keeps you busy? I recently started working for Sport England as one of the Investment Managers that assesses funding applications for various sport related assets. Although it's difficult turning down projects, it's also really rewarding approving applications and seeing how the funding helps support grassroot sport and community groups. Outside of work I am currently playing in the Tyrrells Premier 15s for Wasps Ladies. I made the move across from Premiership Champions last season, Saracens. There is a lot more competition to get into the team at Wasps with many international backs, but the coaching and team ethos is great and I'm being pushed to better myself every week. We train as a team on Tuesday and Thursday evenings, with S&C on Mondays and another gym/fitness session in our own time. It is a challenge to juggle work, training and a social life, and although I like to complain, I wouldn't change it for the world! I've always been a sporty person but I have my very first rugby coach to thank for getting me into the sport. Rugby was not offered for girls at my school, and the local rugby coach came and did a taster session after school and I never looked back. It all accelerated very quickly and I was representing England U20s in my second season of playing rugby. When I went to University I decided to take a step back from the elite side and enjoy playing more socially. I wanted to concentrate on my studies, and look after my mental and physical health which would have been a struggle with the support that was offered by the RFU back then. This has very much improved and I wish I was 18 again now to give it another go! After University I moved to London and was doing shift work so couldn't commit to a club, which is when I started playing tag rugby. I got to make so many new friends and improved my rugby - don't underestimate how much it can help! Once I moved into a 9-5 job I was able to start playing contact rugby again for a club which I intend to do until I'm broken and then go back to tag rugby. Since returning I've played two England Sevens tournaments, scoring a few tries. Although I'm not contracted full time I cherish being called in as and when they need me to represent the Rose. There are many great things about what I do. One being that rugby keeps me fit after sitting at a desk most of the day. I get to go and see my teammates and friends twice a week which most of the time doesn't feel like a chore. During the freezing cold winter months, motivation does sometimes deep, but I think that happens to everyone! Friday mornings are always a stressful time waiting for the team to come out. I find it difficult to concentrate at work whilst waiting for a phone call or an e-mail to hear if I'm in the team or not. Being called into the England team is also a huge honour, but knowing you're probably too old to ever make it as a full time athlete is also difficult to swallow. What is the one thing that you wish people knew about playing Professional Rugby? That playing in the women's premiership isn't actually professional! People may call us professional, but we're amateur athletes with full time jobs, fitting in training where we can. We still pay subs despite some of our matches being televised or in front of a decent crowd paying to watch. If you compare us to our male counterparts, we couldn't be further apart. Although the women's game is developing and heading in the right direction, it still has a long way to go before we are professional. There is the argument that women's rugby doesn't make money commercially from people coming to watch which I understand, but it's going to take a company to take a risk and put some money behind the sport before it has a chance to getting to the professional level. Tyrrell's has been a fantastic addition to the women's premiership and I hope that other sponsors come forward in the near future to continue to help grow the game. I train with the team every Tuesday and Thursday evening and do two gym/fitness sessions a week. The gym/fitness sessions have to fit around my work diary, but I generally try and do one on a Monday and the other on a Wednesday or Thursday so I have time to recover before match day on Saturday. We have an S&C coach at Wasps who gives us a programme and the team also trains together on Monday evenings for those that can make it. Although this doesn't sound like that much training, with a full time job I physically don't think I could do any more without either training fatigued, or burning out.